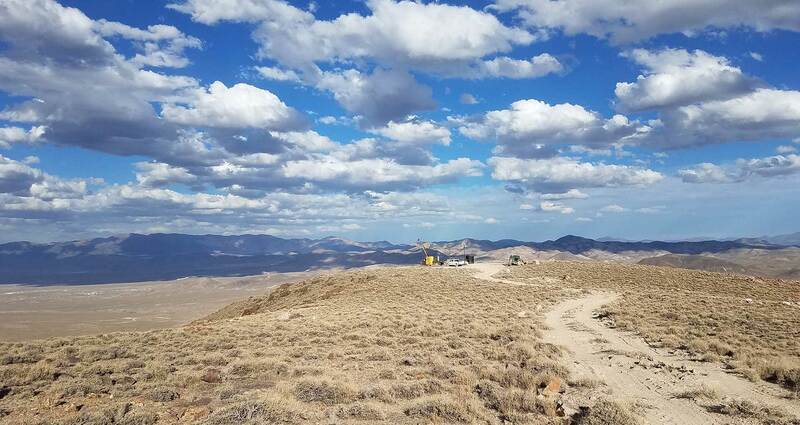 Patriot Gold Corp. (OTCBB: PGOL) today announced the results of its drilling program at its Moss Mine Project located 10 miles east of Bullhead City, Arizona and approximately 70 miles southeast of Las Vegas, Nevada. Located within the Oatman District which has had historic production of +2 million ounces of gold, the Moss vein system can be traced on surface for over a mile. Dipping 40-60 degrees to the south from a high ridge, the quartz-calcite veins and stockworks are being drilled as a bulk minable gold target. Patriot has drilled a total of 15,218 feet in 48 holes. All were reverse circulation (RC) except for 6 core holes. The drill holes have been angled so that they cross the vein at 90 degrees to vein dip where possible. Therefore, true widths will be 80-100% of the intercepts listed. Results include thick intercepts of +0.03 oz/ton gold equivalent values. Among the more exceptional values are 80 feet of 0.081 oz/ton gold equiv. in AR-7, 75 feet averaging 0.046 oz/ton gold equiv. in AR-12, 75 feet at 0.071 oz/ton gold equiv. in AR-23, 95 feet at 0.051 oz/ton gold equiv. in AR-34, and 88 feet at 0.044 oz/ton in AR-50C. A 0.03 oz/ton gold equiv. cutoff was used to tabulate the results as shown below. Patriot holds the Moss property via 65 unpatented mining claims and 15 patented claims (1,600 total acres). The project area is underlain by Tertiary age quartz monzonite intrusive intruding Tertiary age volcanics. Precambrian basement rocks underlie the volcanics. The Moss veins trend nearly east-west and dip to the south. The veins consist of quartz-calcite and lesser adularia. Minor pyrite occurs within the veins at depth. The original target for Patriot at Moss was a bulk minable deposit with a conventional mill used to recover the gold/silver. While this is still an option the company is now doing work to establish the possibility of heap leaching the deposit. This would lower mining and capital costs for the project if feasible and allow mining of lower grade material. With the possibility of being able to mine the deposit to greater depth Patriot plans further work at Moss to test the down-dip extension of the mineralization. Note: Only includes gold equivalent values equal to or greater than 0.03 oz/ton. Silver to gold ratio is 60/1 for gold equivalent. True width is 80-100%.